Meeting the physical, emotional, and psychosocial need of a dying child is important to support the totally dependent child and grieving family in experiencing the best quality of life possible. The child’s terminal illness and care can affect the whole family, hence, the nurse initial role is to establish rapport in order to build and develop effective communication that assists in alleviating unnecessary fears and anxiety about impending death and supporting anticipatory grieving. 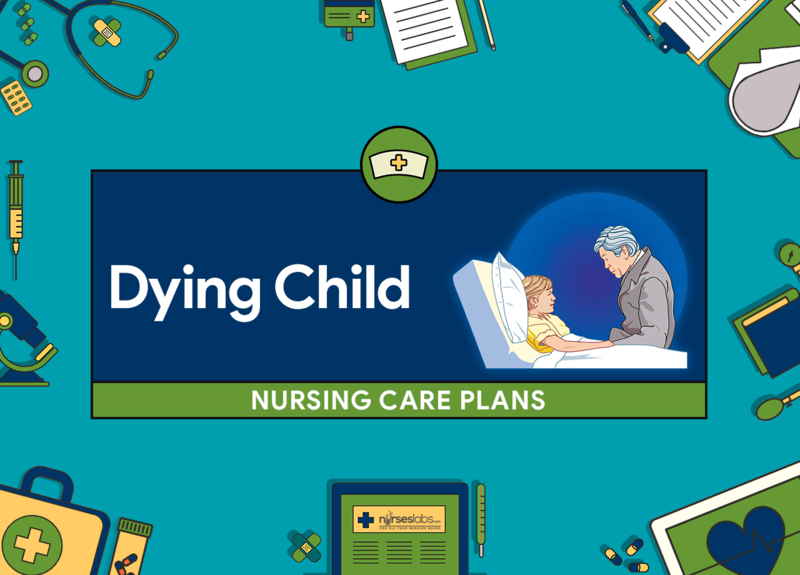 Nursing care plan for a dying child involves providing substantial and appropriate age-related information about death and dying to allay anxiety, providing optimal pain relief through pharmacological and non-pharmacological methods, assisting the child to move through the stages of awareness and acceptance, and helping the family cope through the stages of grieving. Child will appear relaxed and is not crying, grimacing, and moaning. Child will experience less pain. Assess intensity of pain, fear of receiving pain medication, anxiety and coping mechanisms related to pain, ability to rest and sleep. Provides information as a basis for analgesic administration. Developmentally-based pain scales provide an accurate assessment of child’s discomfort. medication administration and expected side effect; that pain will be monitored continuously and medication adjusted as needed to control pain. Provides assurance that pain will be controlled continuously whether or not the child is able to express pain. Support coping mechanisms of child and family and modify analgesic accordingly, with input from child, parents, and physician. Promotes child’s comfort, supports coping abilities and includes parents and child in decision making regarding care. Provide familiar toys/blankets to the child; Encourage parents and significant others to stay with the child at all times. Reduces fear and supports comfort of the child. Provide nonpharmacologic pain management strategies: therapeutic touch, soothing baths; massage therapy to painful areas; distraction techniques (e.g., guided imagery, hypnosis, biofeedback, breathing techniques, music, reading, journal writing, gentle movement, aroma, humor, prayer,, hypnosis, relaxation techniques). Reduces pain perceptions and may foster a sense of control. Dim lights, avoid noise, maintain clean, comfortable bed with loose sheets and clothing, disturb for care only when needed to promote comfort. Provides an environment free of stimuli that increase anxiety and pain. use pillows to support position, move slowly with gentle handling, give a backrub. A nonpharmacologic measure to reduce the pain. Discuss with child and parents that verbalizing fear and feelings about pain and its control is common. Decreases anxiety by recognizing fear of pain and encouraging to express feelings and concerns about methods of control. Educate parents and child that care and treatment will only be palliative. Lessens anxiety and stress caused by apprehension of painful interventions.